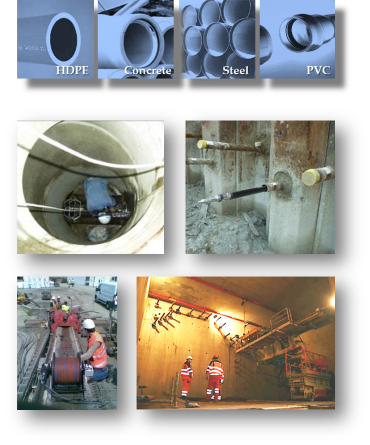 The DuctRunner technology can be deployed in any duct or pipe infrastructure that has pre-determined entry and exit points. The technology is not affected by electromagnetic interferences and can therefore be deployed in steel pipes, near live electricity cables, near railroads, etc. Because the probes operate autonomously, there is no limitation to measurement depth nor does it require above ground tracing. In each of these stages the system output may be useful for different purposes. Currently the most common applications are pipelines installed by trenchless technologies, anchors and freeze holes, upgrade of analog (or digitized) network data to digital data and high definition inclination assessment.